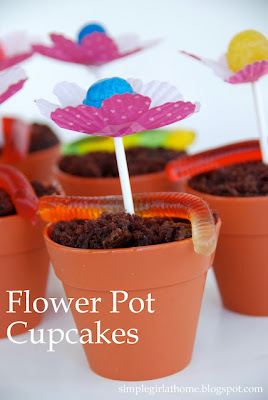 These flower pot cupcakes by Simple Girl are a really cute recipe for Easter dinner and spring birthday parties for little girls. The flowers are made from lollipops and creatively cut cupcake paper. The flowerpot cupcake molds are re-useable (from Target) so you just need to make sure your guest do not throw them away after they devour the treat! See the recipe and step by step images and instructions HERE on the Simple Girl website.